We always welcome new volunteers to join the organisation as without them and our dedicated staff, we couldn’t provide the huge range of activites for our young members that we do. We are now recruiting and developing a young volunteering programme with some of our established young people and are happy to apply for funding to support specific projects. If you’re interested in any of the vacancies you see or would like to have a chat about volunteering, why not get in touch? 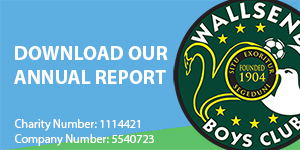 Wallsend Boys Club provides a huge range of free activities for boys & girls of all ages. Why not come along and join in the fun and make new friends! Our brand new facilities include a creche, softplay, room hire & internet cafe. Why not stop by and say hello and check it out for yourself! If your child would like to join us on our amazing adventures or you would like to volunteer to help out, we’d love to hear from you…get in touch! A charity guiding young people to achieve their potential through activities and opportunities.